Vintage Aluminum Measuring Cups- 3 Pieces: 1 cup, 1/2 cup and 1/3 cup. 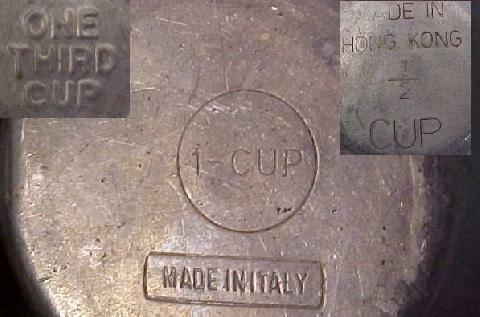 The 1 cup was made in Italy, the 1/2 cup was made in Hong Kong and the 1/3 cup is unknown. Great collector's pieces. Cups do have some denting in them due to age and material. Being sold AS IS! PRICE: $1.99 plus $1.50 special handling charge.